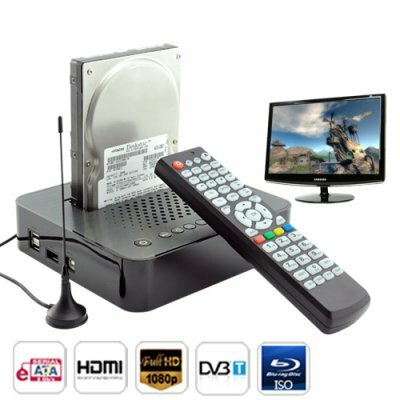 Successfully Added Full 1080P HD Media Center and SATA HDD Docking Station to your Shopping Cart. Powerful, easy to use, and well-made, the Full HD 1080P Media Center and SATA HDD Docking Station is for the person that loves their home media. With support for a whole range of file formats (including Blu-Ray Disc ISO's), this Media Center and SATA HDD docking station is the ultimate home entertainment system for viewing your media files. Powerful: Not only is this media center versatile enough to handle the Web's most popular file formats (including AVI, DIVX, MKV), but it can also play high quality Blu-Ray Disc ISOs (BD ISO). That means you can finally view your favorite high-definition videos in full high-definition resolution (full 1080P) on your high-definition TV. If that's not enough, you can also view (and record!) any local digital television broadcasts thanks to the DVB-T digital TV antenna. Easy to use: It's a docking station! Just insert your 2.5" or 3.5" SATA hard disk drive into the top down slot and you're ready to go - no screwdriver, no installation, no additional hardware needed! Also included are 2 USB slots for instant viewing of your personal media files directly from your flash drive. But that's not all, the full function remote control allows you to control every aspect of the media center from the comfort of your couch. Well-made: USB 2.0, eSATA, AV OUT, and even HDMI - for blazing file transfer speeds and a high quality video display, it doesn't get much better than this media center! Also included is a top of the line video card that won't lag or slow down when playing your most graphically intensive movie files like Blu-ray ripped MKV or Blu-ray Disc ISOs. Last but not least, this media center's all-metal casing sets it apart from all the other cheap plastic media players out there! This amazing high definition media player is available for single piece or bulk quantity orders. Get one today to test drive for yourself, then order in bulk to save on item cost and shipping. Available in our warehouse now, order today and we'll ship it out tomorrow. Brought to you by Chinavasion - your best source of high quality, low-priced gadgets. Does this media center support networking? Yes, you can use it as a network server through the local LAN, but it cannot connect to internet (WAN). Does this media center support wireless networking? Yes, however, you will need a USB WiFi dongle (not included).